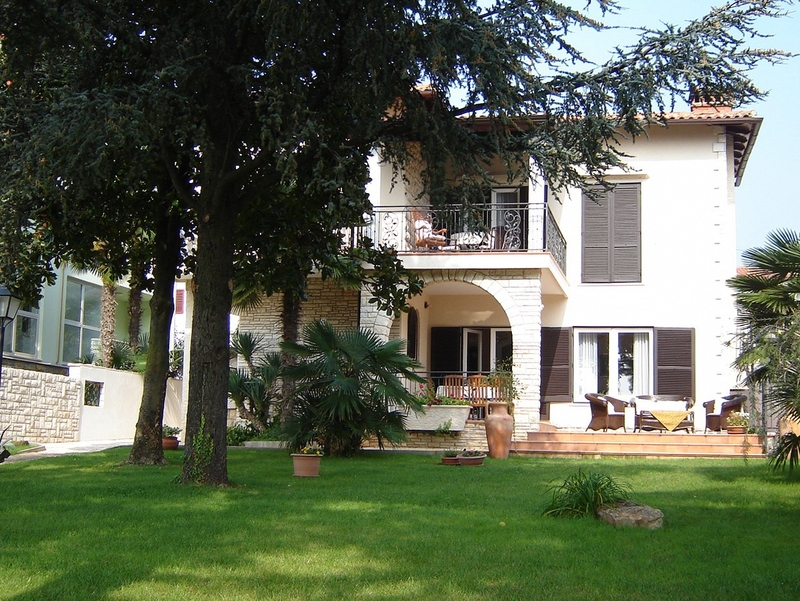 The villa consists of two separate buildings. 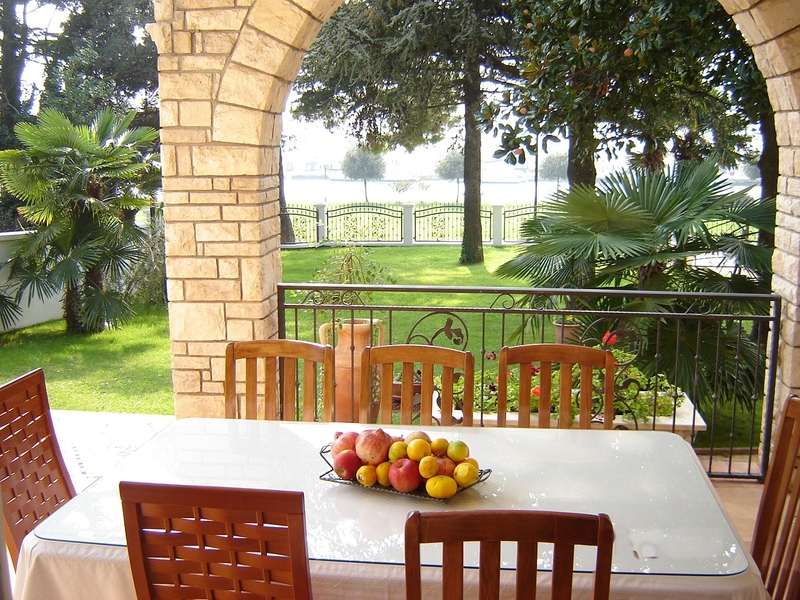 Central living area, located on the south side with open view to the sea and consists of ground floor and first floor. The northern part of the villa, which consists of ground, first and second floors, which houses two completely separate apartments for guests and servants is the second part of the villa. 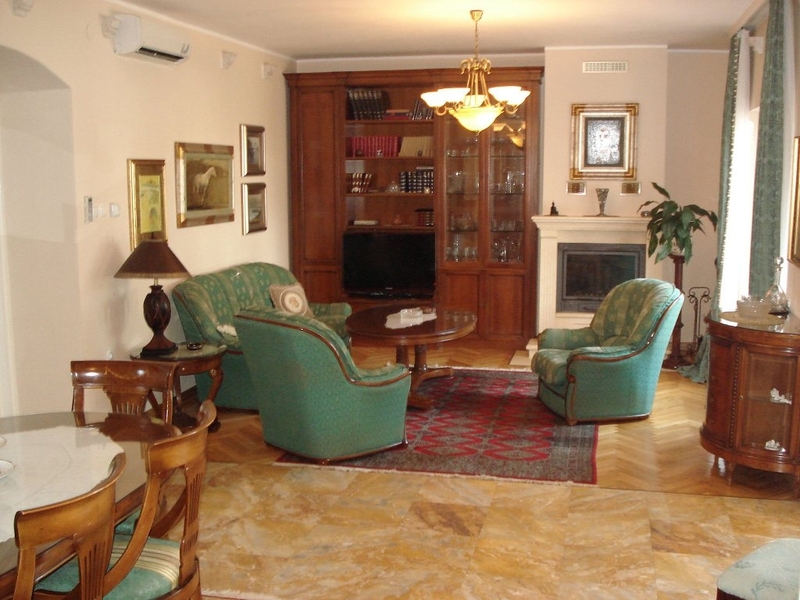 Guests can use the apartment on the first floor, while the apartment on the second floor of the villa is used by staff only during maintenance and cleaning of the villa. 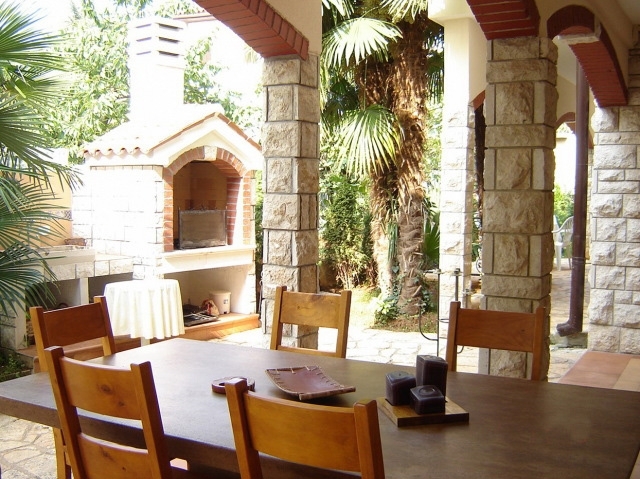 During your stay the staff does not live in the villa, as the villa is intended exclusively for residential guests. 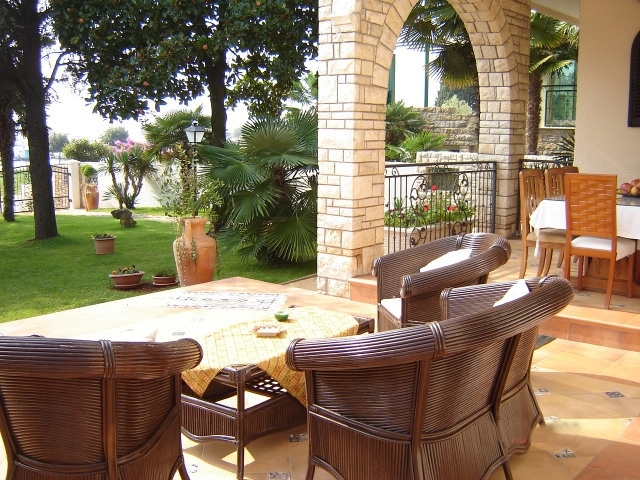 Large spacey terrace which extends on the entire length on the South side of Villa is facing the garden which houses a swimming pool and is surrounded by Mediterranean plants and trees. Free-shaped swimming pool is about 28m2, fitted with hydro massage, massage jets, night lights, summer and winter cover, automatic pool sweeper and solar-heated outdoor shower. Swimming pool’s depth is well suited for both children and adults, as the depth ranges from 0.4m to 1.35m. South side of the villa: Central residential part of the villa extends to the south and east, and consists of ground and first floors. 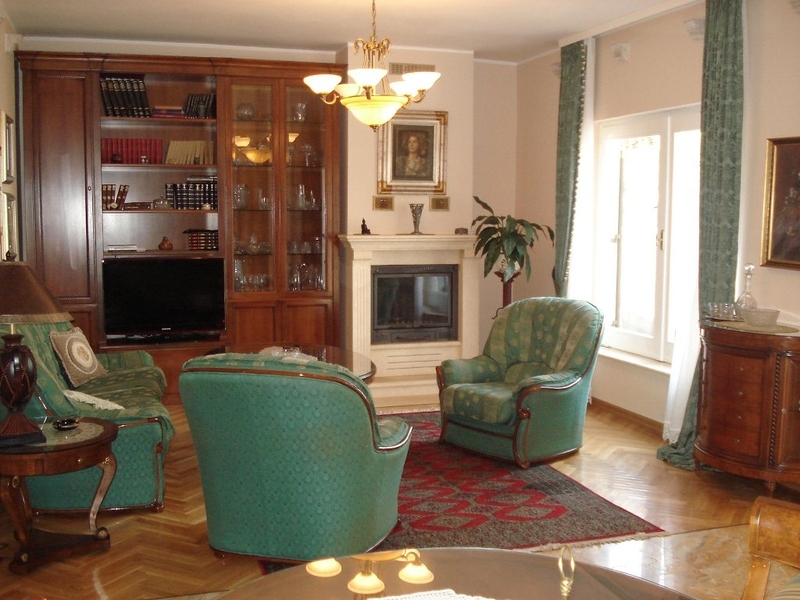 On the ground floor, guests can enjoy living room with marble fireplace, facing open view of sea and the yard. The large open floor plan accommodates dining room and well-stocked central kitchen, along with guest bathroom with a shower stall. From the living room, guests can follow a hall with its oak staircase to a first floor or follow it to two side rooms, one of which features a bedroom with a queen bed, small bath with shower and a laundry room with an outside kitchen. From the eastern backyard, guests enter into separate spa space, containing fitness center, Jacuzzi and a bathroom. Climbing the oak stairs that continue onto the hall to the first floor, guests are greeted with a loft with an entertainment center and a TV. 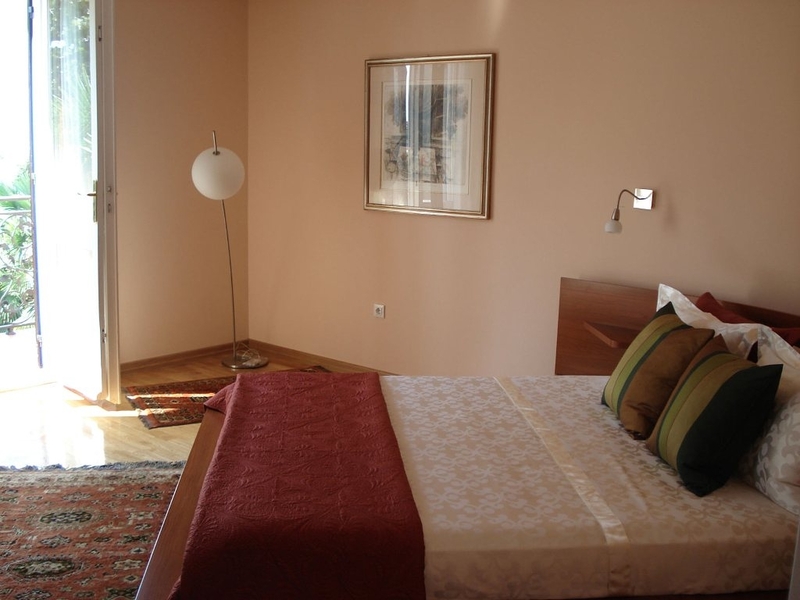 On the left side, two comfortable bedrooms and a beautiful bathroom with a shower are located. The bedrooms open up onto a large terrace that extends the entire length of the south side of Villa, with a view of the entire bay and the old city of Umag. 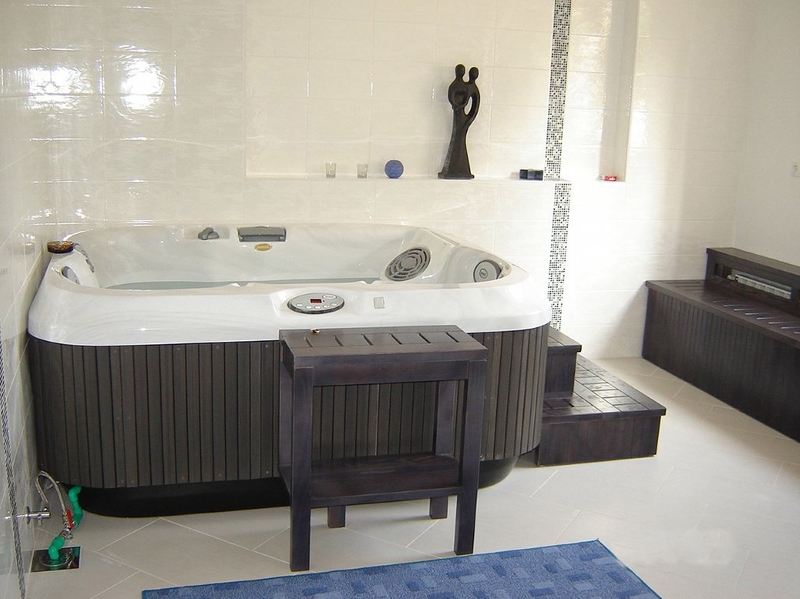 On the right side is a suite, a space that interconnects large master bedroom and smaller children’s room, as well as a beautiful bathroom with a tub and a terrace facing eastern backyard. 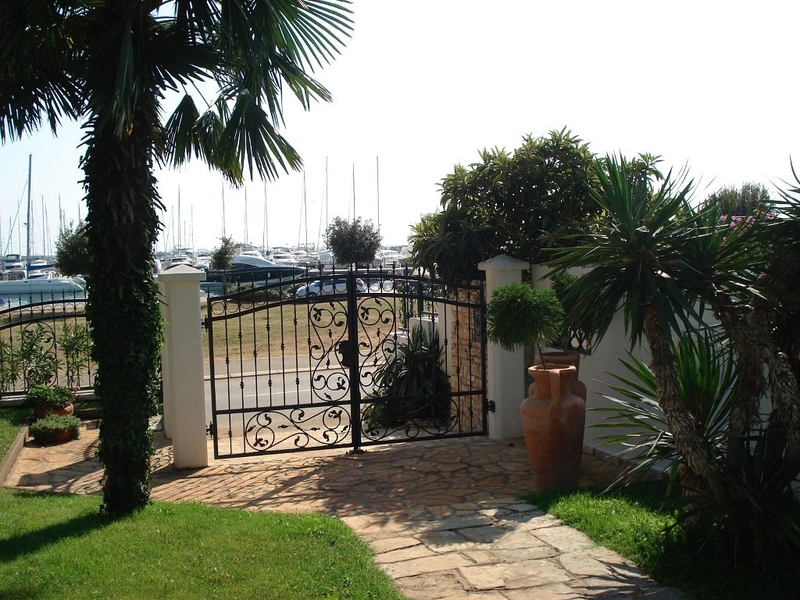 North side of the villa: On the north side of the property, there is a separate entrance with a large iron gate for entrance to parking space dedicated for 3 vehicles. 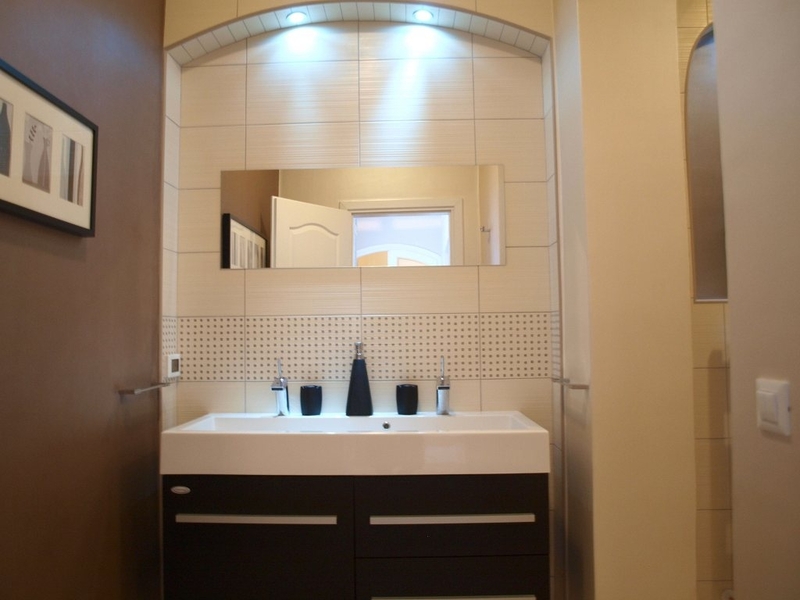 On the north side is also an entrance to the apartment which is entirely separated from the central Villa, with guaranteed total privacy for guests or the staff. 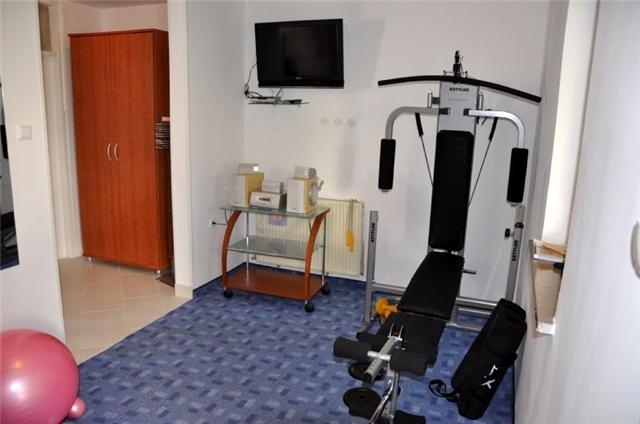 The apartment comprises of fully equipped space for guests or staff, with private back entrance, living room, bedroom with queen bed, open plan kitchen, bathroom with shower and a large terrace. 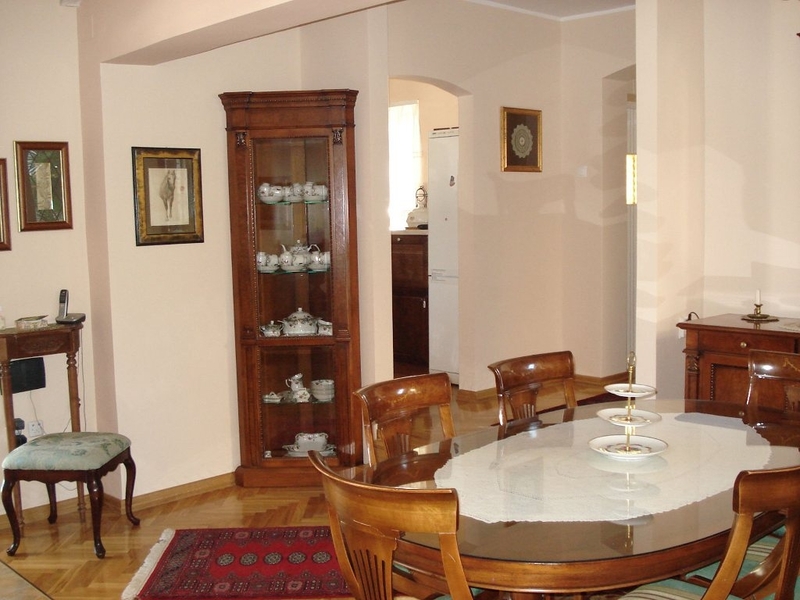 The apartment is fully furnished with well stocked kitchen. 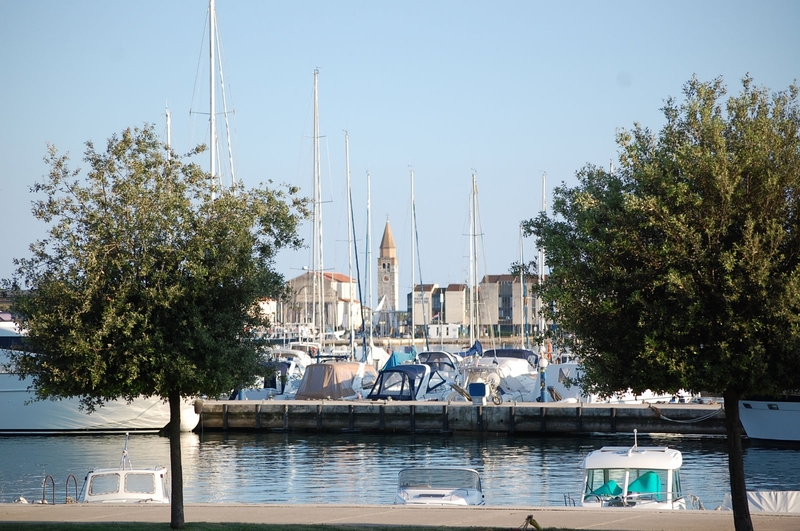 Umag is a picturesque town located in the North West corner of Istria. In Umag you will find some of the beaches with the highest sea quality which is proved by the Blue Flags that can be seen on many beaches in Umag. Some of the most known Umag beaches are Katoro, Aurora, Kanegra and Laguna Stella Maris. The sea visibility is brilliant, so Umag is prime snorkelling territory if you get fed up of swimming and sunbathing. 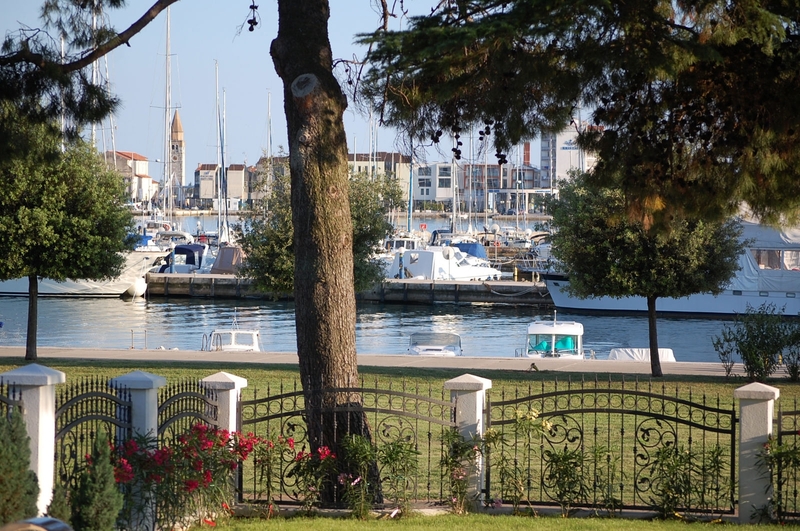 The Old Town is part of Umag’s major history centre and easily explored on foot. It’s closed off to traffic, comes with a sprinkling of quaint, Medieval churches, and a network of alleyways packed with restaurants and cafés. Stroll along the seafront promenade and you’ll find yourself between luxury yachts and a bevy of seafood restaurants.